Tree Cabling and bracing are unique hardware used to support tree branches and leders (tree trunk) that may be weakly attached to the tree trunk. 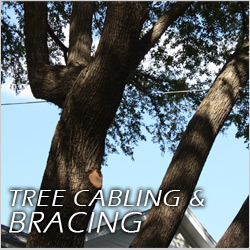 Cabling is used in the tree crown whereas bracing is used to support 2 or more tree trunks that may have a risk of one of the trunks failing from splitting at the opened crotch. We follow all of the American National Standards Institute (ANSI) A300 standards when installing a cabling and bracing application on trees. We use Extra High Strength (EHS) cabling hardware to provide maximum strength to support tree branches. This type of tree cabling has a 3.5 times working load limit over common grade tree cabling. Bracing applications use machine threaded rods along with heavy duty washers and nuts to fasten each end of the rod when being applied to the opened tree crotch. Cabling can be very effective to support parent branches of the crown by cabling weakly branches to another stable tree branch that is to the opposite side to limit movement of the tree branches. However, if tree climber does not have an idea how the tree cabling applications work or where to be placed, there will be more harm done to the tree than good. The tree branches can be easily torn from the tree trunk if the come-a-long device that is used to pull tree limbs closer together is over tighten causing the tree branch to snap. Doing so will cause a permanent undesirable aesthetic look to your tree. It is always recommended to have a professional tree worker that has been trained to install cabling hardware in trees. ANSI A300 recommends that cable is not too loose or too tight but it is just taut. Our tree workers have been trained to do installation of cabling and have been thoroughly discussed the process of cabling and bracing. Bracing applications are used to support co-dominant leders on trees, which will support two or more leders to reduce the risk of the tree splitting and failing from weak crotch. Some trees may require more than 1 bracing depending in trunk diameter and opening. All trees are different, however, our arborists will recommend the right amount of bracing that is needed for your tree. 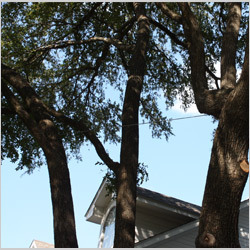 Tree bracing installations are installed with the tree cabling hardware to add extra stability to the tree. For a FREE estimate, give us a call at (972) 743-9959 or fill out the online contact us form and you will be contacted within 24 hours. Thanks for visiting our website! We look forward to servicing your tree needs.